Japan's new defence minister has been sworn in, a day after her predecessor resigned over comments he made about the WWII atom bomb attacks on Japan. 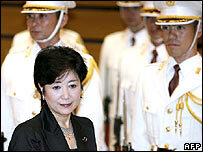 Yuriko Koike is the country's first female defence minister. She has promised to do all she can to regain public trust in the administration of Japanese Prime Minister Shinzo Abe. Experts say Mr Abe has been damaged by the loss of three ministers from his Cabinet in 10 months. Fumio Kyuma was forced to step down after saying the US atomic bombings of Hiroshima and Nagasaki at the end of World War II could not be helped. Some newspapers here have noted that Yuriko Koike has little experience in military matters. She has been chosen over other members of parliament who are defence specialists. There has been a hint of sexism in some of the criticism too. One lawmaker described the new job as "a little too much for the first female defence minister to handle". But Mr Abe moved swiftly to promote his national security adviser to her new ministerial role. It is a reflection of his desire to try to put the scandal of her predecessor's resignation behind him as quickly as possible before elections for the upper house of parliament here later this month. Ms Koike is an accomplished media performer. She told reporters she would work to heighten trust in the administration. The prime minister has told her to make the realignment of US forces in Japan her priority. He will probably be hoping she will not be making headlines - unlike the man she has replaced, who embarrassed him on more than one occasion.